Hashim Amla’s hundred wasn’t enough to help South Africa set a total beyond the reach of Pakistan, who eventually completed victory with five wickets and five balls remaining. South Africa won the toss and elected to bat, but though their batsmen never looked unduly troubled, their whole innings seemed to be building up to an explosion that never truly came. They were given a strong start by openers Hashim Amla and Reeza Hendricks, who put on 82 for the first wicket before the latter top-edged a slog sweep of Shadab Khan and was caught by Hasan Ali at midwicket five short of his half-century. What a way to get to your 27th ODI 💯 - with a six! Hashim Amla finishes on 108*, while debutant Rassie van der Dussen made an excellent 93. Debutant Rassie van der Dussen entered, and though he was a tad skittish to begin – overturning a caught-behind decision on review, almost chopping on, and then almost chopping on and surviving a run out chance from the same delivery – he soon grew into his work, striking powerfully and looking the most likely to give South Africa a strong finish, before he succumbed seven short of a century on debut. Amla was almost the opposite, batting fluently at first before receding into his shell. After bringing up his half-century with a boundary in the 24th over, he didn’t find the ropes again until the 42nd over, when he was nearing his hundred. His strike-rate didn’t suffer too much as he managed to pick singles, but with so many wickets in hand, one wondered whether South Africa could have taken more risks earlier. Even right at the death, boundaries were hard to come by. Though Amla brought up his 27th ODI hundred with a six in the 48th over, that was one of just three boundaries managed in the last five overs. This was in part down to an excellent death-bowling performance from Pakistan, and Faheem Ashraf and Hasan Ali in particular, and also the perceived slow nature of the pitch. And while it wasn’t quite enough, it certainly set up an excellent contest, even as Pakistan chose a more aggressive approach. 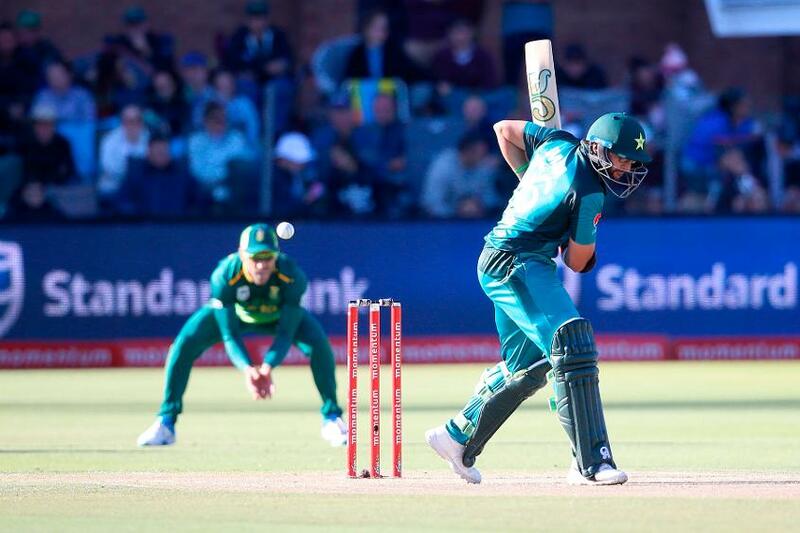 After absorbing pressure for the first two overs, they attacked Kagiso Rabada, Fakhar Zaman taking him for two consecutive boundaries and Imam-ul-Haq smoking a flat-batted shot over midwicket for six, a mark of his exceptional form. Two more boundaries followed in the next over, and Pakistan were away. Mohammad Hafeez's 71* seals the first ODI against South Africa with five wickets and five balls in hand. Duanne Olivier dismissed Zaman with a bouncer when the opener had made 25 to give South Africa hope, and though Pakistan rebuilt through Babar Azam and Imam, a sequence of eight overs without a boundary forced the former to play a rash shot and be bowled by the innocuous part-time off-spin of Reeza Hendricks. In a way, the dismissal summed up the difference between the sides. While it lead to Babar’s wicket, his adventure showed that Pakistan weren’t willing to get bogged down, and were willing to try something unorthodox to up the rate. Imam-ul-Haq was another who fell attacking, selflessly attempting to smoke Olivier over cover even with a century in sight. South Africa’s total wasn’t far below par however, and while Pakistan were ahead there was still work to be done. Shoaib Malik and Sarfaraz Ahmed each fell in the space of seven balls to make the game interesting, but Mohammad Hafeez’s sparkling half-century kept the tourists’ noses in front, and his pair of boundaries in the 47th over effectively sealed the game as a contest. He finished 71 not out as Pakistan secured victory with five wickets and five balls in hand.